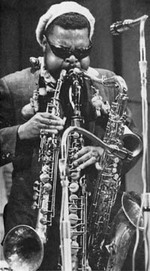 Rahsaan Roland Kirk released an album in 1973 titled Prepare Thyself to Deal with a Miracle. It features a live 21 minute saxaphone solo. When you listen to it, it's impossible to discern when the man took a breath. Incredible. We are in the process of transitioning sections of Attensa.com to the MoveableType platform. Yesterday our crack web team showed me MoveableType Enterprise in action working on our servers. We're starting with the news section so that loading news releases, updating our news coverage and event schedule will be as easy as posting to this Typepad blog and there will be a feed for each section. I'll be working with this miracle. Incredible. If you are looking for insights into the role of social networking in the Enterprise, you need to subscribe to Dion Hinchcliffe's Enterprise 2.0 blog. In today's post he looks at the new Gartner Hype Cycle report. Gartner sees collective intelligence as the most important trend coming from the application of Web 2.0 technologies to solve business problems. collective intelligence: an approach to producing intellectual content that results from individuals working together with no centralized authority. This is seen as a more cost effective way of producing content, metadata, software and certain services. "That might be because Web 2.0 offers a sort of inverted way of looking at the way we do things now. Web 2.0 frequently embodies the emergent and freeform instead of the predefined and structured. It's often bottom-up instead of command-and-control. 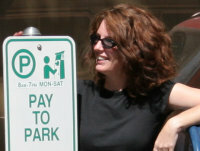 It's self-service instead of being mediated." Both the Gartner report and Dion's analysis make the point that companies who have a clear vision and plan for putting social networking to work behind the firewall will have a clear competitive advantage. Apparently the Attensa toolbars we introduced more than a year ago for tagging, identifying, previewing and subscribing to feeds and our tagging toolbar are pretty good ideas. Newsgator just announced a beta of their toolbar today. Here's a duplicate of a post I wrote in December 2005 describing the wonders of the Attensa toolbar for Internet Explorer and Firefox. The Chiclet problem surfaces at the Syndicator Blog. The rash of badges is totally out of hand. Attensa has another approach to finding feeds and easily subscribing from a Web page or blog from your browser. We use a toolbar in IE or Firefox to identify feeds and to let you see what kinds of articles are available before deciding to subscribe. This eliminates the need to clutter a page with branded badges. On the one hand this may not be the brightest marketing move on Attensa's part... but it sure makes sense from a user's perspective. P.S. Thanks for letting us know it's a great idea, Newsgator. Michael Arrington has created a phenomenon building his TechCrunch readership to 80 thousand in less than a year. Impressive. 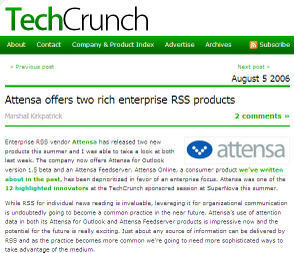 Attensa's history with TechCrunch goes back to our launch last summer. Last Thursday we sat down with Marshall Kirkpatrick who recently joined the TechCrunch team. Marshall just moved to Portland and we were delighted connect and bring him up to date on our products and progress and talk about all things related to RSS, social networking, Web 2.0 business and where he should eat and drink now that he's here. We even offered to help him. Marshall got right on it and posted on the Attensa Feed Server and Attensa for Outlook 1.5 on Saturday. We really liked this line..."Attensa’s use of attention data in both its Attensa for Outlook and Attensa Feedserver products is impressive now and the potential for the future is really exciting. Just about any source of information can be delivered by RSS and as the practice becomes more common we’re going to need more sophisticated ways to take advantage of the medium." You can read the rest of "Attensa Offers Two Rich Enterprise Products here."